Courtesy of RE/MAX Alliance-FTC South, Terrence Hassett. Peaceful mountain home. 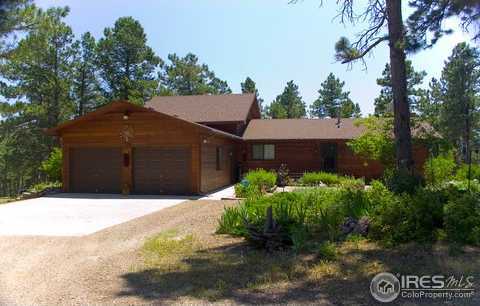 Secluded ranch style with finished, walk-out basement on 9.93 park-like acres just 45 minutes from Ft Collins. Approx 40×64 Cleary building includes a 10×30 heated office and 2-12×16 overhead doors. 2 stall barn + fence for horses. 444 s.f. deck plus hot tub. Large family room addition. This is a phenomenal property. Shown by appointment only – do not disturb residents. Buyer to verify all facts and measurements which are not guaranteed. See broker remarks. Please, send me more information on this property: MLS# 868559 – $680,000 – 269 Cox Ct, Bellvue, CO 80512. I would like to schedule a showing appointment for this property: MLS# 868559 – $680,000 – 269 Cox Ct, Bellvue, CO 80512.